Whenever you travel with your friends or family, it is compulsory to book the best vehicle for your journey. If you are a group of 20 passengers, we will provide you 20 seater Tempo Traveller on Rent from Delhi to any outstation destination and you will never get delay to reach your desired location. We always make a tour plan for any outstation but sometimes we forget to choose right vehicle our journey and that is very horrible for you because if you choose a wrong vehicle for your journey, you will not get enjoy in your trip and it will be worst. So, being an affordable and Reliable travel agency in Delhi, it is our priority that we suggest to our customer for the best vehicle during their journey. Our 20 seater Tempo Traveller Rental service will fulfill your all travel needs and you can cover all sightseeing easily as per your requirements. This vehicle has 20 luxury pushback seats with Air conditioner and other luxury facilities. 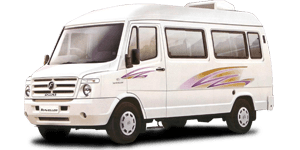 So, next time when you will plan an outstation sightseeing trip with a group, you should choose Experience Tours for 20 seater Tempo Traveller in Delhi and get a memorable travel experience for lifelong. All seats are pushback with the 2x2 seating configuration and there is also ample space for luggage & moving inside the vehicle. This modified Tempo Traveller is driven by a highly experienced and well-trained driver who has a good knowledge of all routes of long destinations. Experience Tours is a private travel agency based in Delhi and we provide 20 Seater Tempo Traveller on Rent according to the basic requirements of customers who want to travel with a big group. Customers want affordable and best travel service for their tour package and we customize the best package including all like transportation, sightseeing, and accommodation etc after hearing all requirements of them. Our service of 20 seater Tempo Traveller in Delhi is available at 24/7 for any local or outstation trip with the cheapest rate. Our service is very cost effective to hire any vehicle for local airport pickup/drop or Delhi sightseeing with high comfort. We provide our Tempo Traveller in Delhi for per day basis and per km basis according to the journey. You can explore all sightseeing in Delhi with our tourist vehicles such as Red Fort, Jama Masjid, Lotus Temple, Akshardham Temple, President House, Jantar Mantar, Qutub Minar, Humayun's Tomb and many more. So don't miss the chance and book our Tempo for your group tour packages. For Hiring tempo traveller booking visit at www.tempotravellerdelhi.co.in or drop mail at Our Mail Address.